Cut the messy measuring out of dishwashing with handy water soluble packets with just the right amount of detergent for the job. Get a proper clean without inconvenient measuring or dangerous exposure to chemicals, and no waste due to overpouring. A highly concentrated fast-acting detergent for pots, pans, dishes and glassware. Penetrates food and heavy grease deposits while maintaining longlasting suds. Phosphate-free. pH balanced to be mild on hands. Highly concentrated formula saves storage space and reduces shipping weight. Use one pak per five gallons of water. Application: Dishwashing; Applicable Material: Cookware; Dishware; Glassware; Pots; Pans; Silverware; Utensils; Dirt Types: Dirt; Food; Grease; Scent: Lemon. 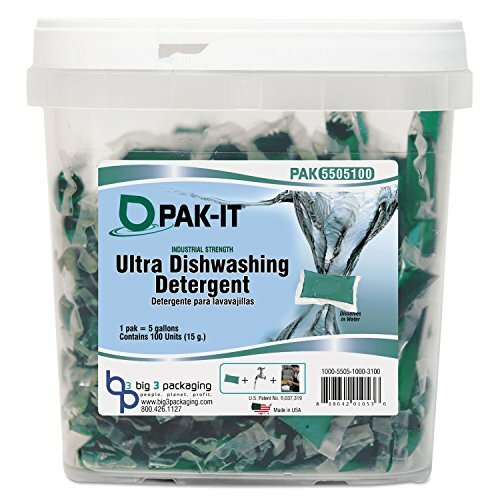 Water soluble packaging providing the extact amount of dish detergent for the job. No measuring or exposure to concentrated chemicals, or risk of overpouring. Highly concentrated fast-acting detergent for pots, pans, dishes and glassware. Penetrates food and heavy grease deposits while maintaining longlasting suds. If you have any questions about this product by PAK-IT, contact us by completing and submitting the form below. If you are looking for a specif part number, please include it with your message.